Bird-loving Americans share a common problem: squirrels! These fast, greedy, incredibly crafty, fluffy-tailed rodents pillage birdfeeders before owners' very eyes. For 25 years, Outwitting Squirrels has been leading the charge to help bird lovers defend their feeders. This classic defense manual for the besieged birder has been fully updated to deal with the more tech-savvy twenty-first-century squirrel. 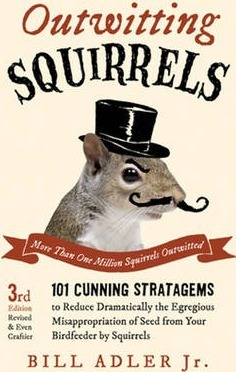 It provides 101 cunning strategies, both serious and hilarious, for outsmarting these furry, but not so cute, creatures. Adler discusses the different bird personalities and the best seed to attract them. He rates birdfeeders based upon how squirrel-proof, or squirrel-vexing, they are and discusses creative antisquirrel structures and devices. Spooker poles, Perrier bottles, baffled fishing line, Teflon spray, Vaseline, water bombs, cayenne pepper, and Nixalite--the author has tried them all, and here he regales intrepid bird feeders with his squirrel-thwarting adventures and misadventures. Bill Adler Jr. is the author of more than 20 books including How to Negotiate Like a Child: Unleash the Little Monster Within to Get Everything You Want and Boys and Their Toys: Understanding Men by Understanding Their Relationship with Gadgets. In his spare time, he studies Japanese and flies airplanes.